(Phys.org)—Twin NASA probes orbiting Earth's moon have generated the highest resolution gravity field map of any celestial body. 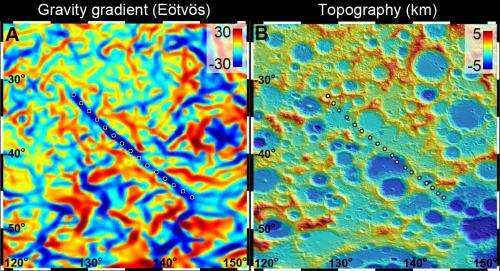 The new map, created by the Gravity Recovery and Interior Laboratory (GRAIL) mission, is allowing scientists to learn about the moon's internal structure and composition in unprecedented detail. Data from the two washing machine-sized spacecraft also will provide a better understanding of how Earth and other rocky planets in the solar system formed and evolved. The gravity field map reveals an abundance of features never before seen in detail, such as tectonic structures, volcanic landforms, basin rings, crater central peaks and numerous simple, bowl-shaped craters. 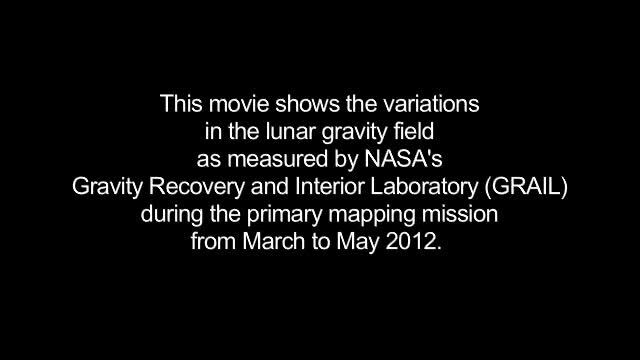 Data also show the moon's gravity field is unlike that of any terrestrial planet in our solar system. 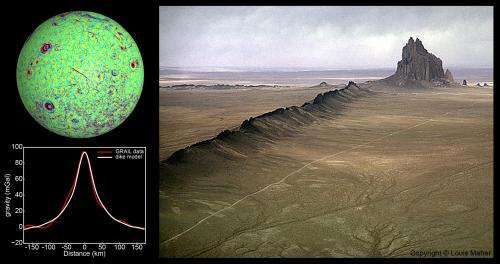 According to Zuber, the moon's gravity field preserves the record of impact bombardment that characterized all terrestrial planetary bodies and reveals evidence for fracturing of the interior extending to the deep crust and possibly the mantle. This impact record is preserved, and now precisely measured, on the moon. The probes revealed the bulk density of the moon's highland crust is substantially lower than generally assumed. This low-bulk crustal density agrees well with data obtained during the final Apollo lunar missions in the early 1970s, indicating that local samples returned by astronauts are indicative of global processes. While results from the primary science mission are just beginning to be released, the collection of gravity science by the lunar twins continues. GRAIL's extended mission science phase began Aug. 30 and will conclude Dec. 17. As the end of mission nears, the spacecraft will operate at lower orbital altitudes above the moon. NASA's Jet Propulsion Laboratory in Pasadena, Calif., manages the mission for NASA's Science Mission Directorate in Washington. GRAIL is part of the Discovery Program managed at NASA's Marshall Space Flight Center in Huntsville, Ala. Lockheed Martin Space Systems of Denver built the spacecraft. "With this crustal thickness, the bulk composition of the moon is similar to that of Earth. This supports models where the moon is derived from Earth materials that were ejected during a giant impact event early in solar system history." The Moon shouldn't have much of a Mantle at all, and should have almost all "crust" since the Mantle should have hardened. With a lower amount of mass than the Earth, the Moon should have run out of both radioactive material and accretion related heat many times faster than the Earth. This means the crust should have cooled far faster; The Moon should cool six or seven times faster than the Earth. This in turn means the Moon's crust should be much thicker than the Earth's crust*, not thinner, if it had actually come from an Earth impact, since both would have been molten at the same time had they actually been formed from an impact. *obviously this is limited by the radius of the smaller object. Apparently, there was sufficient time after the Moon's formation for the differentiation of mantle and crust --which are characterized mineralogically, as opposed to stratigraphically. What I noticed was the markedly more intense gravity strength of many of the craters. Does this indicate impact by high-density(Ni-Fe) asteroids, as opposed to more chondritic or cometary bodies? Lurker: Are you trying to say that the radioactive elements in the moon should have decayed faster? Last time I checked, decay rates didn't depend on gravitational field strength. The moon may have lost its heat of accretion faster, but there is still the heat generated from residual decay. Uranium and thorium have enourmously long half lives. Al-26 may have generated a lot more heat during and just after initial formation, but even on earth, that heat has been dissipated. The crater and linear gravity anomalies have a simple explanation in an 'Electric Universe', but to consider such heresy will subject you to the ridicule of those who believe that gravity is the only force of consequence (beyond molecules) in the Universe. Does this indicate impact by high-density(Ni-Fe) asteroids, as opposed to more chondritic or cometary bodies? Not necessarily. Most of these high-gravity craters are on the side facing away from Earth. The crust in this parts is composed of mafic rock types like andesites or anorthosites with densities lower than for example basalt. We know that many large crater are filled with basaltic lavas which, together with upwelling of deeper mantle plumes, may show up on as areas with higher gravimetric readouts.